Thousands of years before the advent of LEGO, Tibetan Buddhist monks were mastering the MOC (My Own Creation). Mandalas are an ancient, sacred form of Buddhist art. They are similar to LEGO in being colorful, imaginative displays of creativity, but the multi-colored plastic pieces are replaced with multi-colored sand. The mandala is meant to represent impermanence. If imagining the creation and destruction of the universe sounds overwhelming, these elaborate exhibitions of artistic talent bring the abstract idea of temporariness into a more tangible, bite-size depiction. They also offer ways to further enhance our LEGO building experience. Per the ancient Buddhist traditions that are still practiced today, the monks begin a mandala by determining its intention. The theme, which can focus on such topics as compassion or wisdom, is aligned with particular deities and geometric patterns to infuse the unique spiritual and sacred qualities that each mandala possesses. Once a theme is decided, the monks consecrate the site through music, meditation, and mantra recitation. Unlike most art that is intended to last for the ages, after all the time and effort has been exerted to create the mandala, this stunning display of artistry is destroyed. In a Dissolution Ceremony the monks ritualistically dismantle the mandala, removing the colored sand. Some of the sand is distributed to the audience as a blessing for health and healing; what remains is collected and released back into nature. Growing up, I found myself in a relentless battle between appreciating my LEGO masterpieces and adding a coat of superglue to preserve them for the ages. If this sounds unusual, my eight-year-old self would tell you that what is really unusual is creating a work of art only to destroy it at clean up time. In the end, I agreed to take it apart, but it was always begrudgingly and not without my mom first taking a picture for posterity. Thirty years later, I watch in amazement as my kids spend hours building a LEGO tower only to knock it down in a fit of laughter. No qualms. No pouting. No pictures to reminisce for all of history. They enjoy the construction and the destruction. According to Buddhist teachings, all things have a transient nature. Whether that thing is tangible or intangible, organic or inorganic, it is undergoing a constant process of change. This is the essence of impermanence—reality is never stagnant but is dynamic throughout. Release from them is bliss supreme. What we gain from LEGO is bliss supreme. If we cling to something (the current state of a relationship, a time in our life, a particularly impressive LEGO configuration), we will feel anxiety when it changes. If we can avoid clinging, there is no anxiety. We will more quickly accept the change, thereby experiencing a painless assimilation (allowing relationships to evolve, aging gracefully, discovering new LEGO configurations with which to shock and amaze). People who cling to ideas feel stress when they are wrong or when the idea becomes outdated. They typically come up with reasons and excuses to rationalize their decisions, clinging to behavior patterns or to a self-image even when it no longer benefits them. We all experience this to some degree; it can be difficult to change once we’ve found something that works. Buddhist philosophy, however, teaches that clinging is always unfavorable, even when the thing to which we cling has a positive effect. In his book Positive Addiction, famed psychiatrist William Glasser argues that compulsive habits such as jogging and transcendental meditation “strengthen us and make our lives more satisfying.” Yet, while these activities enhance health, creativity, and feelings of self-efficacy, Buddhist thought warns against becoming dependent. If you cling to daily meditation or exercise, you will feel anxiety on the days you are unable to do it. To avoid this counterproductive stress, impermanence helps us eliminate our attachments. By removing these attachments, we remove the delusions and trappings of false security, thus equipping ourselves for life’s barrage of rapid-fire change and getting us closer to the Buddhist idea of Nirvana. When we look at LEGO bricks, their impermanence is evident. For instance, the materials that make up a LEGO brick changed from Cellulose Acetate to Acrylonitrile Butadiene Styrene (ABS) in the 1960s. Some bricks have thinner walls with different shaped tubes when compared to their 1980s predecessors. Instructions are much more complex than they were twenty years ago, with some booklets containing hundreds of pages separated into multiple books. Even the LEGO logo has gone through multiple variations over the years—twelve at last count. The process of change can be slow and incremental, yet it is constant and inevitable in all aspects of existence. While much change takes place without our ever noticing, impermanence is verifiable through direct observation. It may require patience, but it is there. A LEGO piece left in direct sunlight will take months before you realize its color has faded, and even then you may need another LEGO brick to discern the contrast. However, since LEGO utilizes aerospace-like industry standards to mold their bricks, it is improbable that they will undergo significant physical changes. More likely, your perception of these bricks will evolve long before the pieces themselves do. Consider the way you perceive a particular LEGO piece. The 1´4 blue brick with bow that was once associated with the roof of the LEGO Cinderella’s Dream Carriage (set #41053) is now unidentifiable in a Tupperware container of assorted sets. And the structure you once believed to be the Da Vinci of all LEGO works is a pale comparison to what you are able to create today. Skills evolve, experience accumulates, and every LEGO project raises the bar for your next endeavor. Understanding impermanence is necessary if we are to lead fulfilling, productive lives. In our relationships, how often are friendships made in the LEGO aisle of a store? How often do alliances deteriorate because one of the people involved refuses to share his LEGO blueprints? How often does a significant other evolve from a Non-LEGO spouse (NLS) into a LEGO enthusiast? And how often does an adult fan of LEGO (AFOL) become the parent of LEGO-loving kids? Our relations with others are entirely marked by impermanence. When we fight this, we tend to put others in a box. We get locked into who someone is without allowing them room to grow and change over time. Then, when the change becomes too noticeable to ignore, we call them a fraud because they no longer match the person we decided they were always going to be. Their growth was always happening, yet we feel betrayed because we are fixed on their illusory permanent state. This is true when we write off our LEGO building buddies for only wanting to spend half their free-time on LEGO-related activities, and when we do not accept a newbie to the LEGO life because they haven’t enjoyed LEGO as long as we have. In both instances, we are not allowing change, thereby alienating ourselves from reality and more meaningful bonds. Here we can learn a lesson from Buddhism. Funeral attendees are then asked to “remember death” for this will discourage excessive desire and remind us of our own ultimate impermanence. From the moment of birth, we move inexorably towards death. It is easy (and understandable) to view this as bleak, but Buddhist philosophy does not emphasize death to depress us. Instead, the certainness of death is intended to motivate us to make the most of our time by not getting fixated on petty, unimportant items. LEGO is no different. From the moment a new LEGO set goes on sale, it is one step closer to being discontinued. The set may still exist on eBay, but the opportunity to buy a new set will never be available again. Once you purchase it, the LEGO set progresses inescapably towards the land of misfit toys. You can do everything possible to preserve them, but the unventilated attic will not allow your LEGO to remain in “good as new” condition. Even if the LEGO bricks manage to retain their freshness, the pieces will quickly decay once you pass your LEGO collection on to your children. Finally, impermanence is key to understanding the ultimate nature of life. With all things being perishable, we begin to see their lack of substantial existence. This is true for ourselves and for the world around us. In a sense, impermanence is the property of “not-self.” To explain, self is a convenient term for a collection of your physical and mental personal experiences. It is no different than using the name “LEGO Star Wars Death Star” for a collection of LEGO pieces that when assembled, creates the iconic Star Wars structure. The gray, rectangular plates are not the LEGO Star Wars Death Star (set # 10188). Neither is the hallway structure, the elevator pulley, or the Darth Vader figure. The LEGO Star Wars Death Star illustrates the basis for the Buddhist rejection of the self. To disagree is to believe in the existence of something that does not exist, an independent, permanent entity. There is no core of personal experience apart from the ever-shifting, inter-reliant, transitory elements of our beliefs, and behaviors, and judgments, just as there is no LEGO Star Wars Death Star without its 3,803 pieces. By denying self, we begin to recognize that personal experience is like our aforementioned LEGO Star Wars Death Star. When we dismantle it brick by brick, systematically examining each piece, we find that the self, like the Death Star, lacks any substantial permanent essence, that it is bereft of the sum of self. Then, once we remove the delusion of seeing things as permanent, wisdom occurs. And when wisdom occurs, personal experiences can be fully experienced. So let’s dismantle our personal experiences. Impermanence is not an occasion for sorrow, but rather recognition for the unavoidable realization that reality is in a perpetual state of change. It is a time to acknowledge that all things will end, appreciate the time spent doing it, and celebrate how it has enriched our life. This frees us from trying to “superglue” our worldview through failed attempts to keep everything as is or becoming overly fixated on any one goal or object. We can then adopt a renewed vigilance to remain open to new experiences, for as every LEGO project ends, another is soon to follow. Check out David Kahn’s website here. 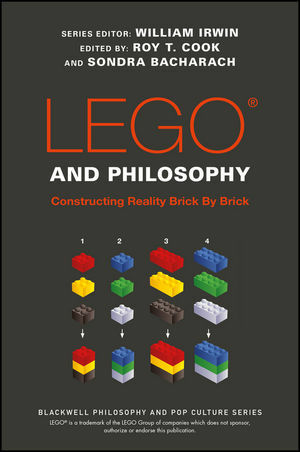 *This essay is excerpted and adapted from Lego and Philosophy.